Don't settle for just Lake 'views'....be RIGHT ON THE WATER! Walk down from our lakefront deck (with a bbq & patio furniture), on to our private pier, and jump right in to the water!!! We have 2 moorings to house all your water toys and when the water levels are low, we have a small sandy beach right infront of our home. Inside you will find the house kept in prestine condition, with outstanding amenities like our full-size Billiards table, master bedroom double Jacuzzi tub, flat screen TV's with FREE HBO & Showtime, free wi-fi, plush linens, grand rock fireplace, and much more!! The gated driveway provides privacy in a quiet residential setting. The cabin is comprised of 4 upstairs bedrooms and 3 baths. The master suite has magnificent views and also offers a Jacuzzi tub and a two-headed rock shower. The other 3 rooms share the second upstairs full bath while the 3rd half bathroom is located on the first floor. The main room’s large windows have magnificent lake views and allow for lots of natural light. Our lakefront deck with Jacuzzi and private pier is always enjoyed despite the season. The large family room is a great place to gather around our rock fireplace and watch TV on our flat screen. If you are feeling hungry after a game of Billiards, come prepare a full-course meal in our newly remodeled kitchen with granite counter tops. When the weather is warm, get in touch with your adventurous side and go water skiing, mountain bike riding, or hiking along one of the many trails. We are right on the water and Regan Beach is about five houses down from us. If you choose to stay with us during the wintertime, make sure you hop on to one of the mountain for a thrilling ski ride down the slopes. Our combination of high-end pillows and mattresses are dressed with luxurious 600-thread-count Egyptian cotton sheets in every room. The washer and dryer are conveniently located off of the kitchen. Laundry baskets and hangers are provided in each room. We provide fragrance free detergent and laundry softener for all of our guests. High Speed Wireless Internet accessible throughout the entire house and on the back patio. Located right off the kitchen, our old fashioned wood burning stand alone stove its definiately a sight too see, especially for the young ones. We provide gourmet coffee, creamer, tea and sugar to enjoy at any time of the day. Our kitchen is fully stocked with utensils, dining sets, a state of the art knife set, and immaculate pots & pans. We provide HBO, Showtime, or other premium channels on our 55” high definition flat screen TV. We have DVR capabilities so you can record your favorite shows and watch them whenever you want. Very close to casinos and several different ski resorts with Heavenly being less than 10 mins away! We loved the views from the hot tub, plus the kitchen was amazing. The decor, the margarita bar, and the master bedroom were other highlights. Can't wait to return sometime in the summer to use the entire outdoor area and pier!! And to get checked in by our host via his boat! Beautiful house on the best Lake I’ve ever been to. Completely stocked kitchen, wonderful deck and pier for enjoying the lake. Close to everything in South Lake Tahoe. AMAZING Estate!!! Gorgeous! Must see to believe! My friends and I stayed in this gorgeous estate. It is locate right on the water. The concierge welcomed us at the door. She walked us through on how to use all the special equipment such as Jacuzzi and fireplace. The kitchen is newly remodeled. The coffee tastes great. We used everything they left us in their large gift basket of yummy food, wine, and treat. This trip was by far the best I have taken in a long time. The Jacuzzi was my favorite however, everything was perfect! We stayed here for a bachelorette getaway. It had everything we needed. A large, open kitchen let us all cook and hang out for meals. The hot tub was amazing since there was still a little snow on the ground and the beds were crazy comfortable. The view is awesome and the house feels private. I would definitely recommend this place! This house is a gem! What an outstanding place to call home for our week-long vacation at Lake Tahoe. Everything about the house, the setting, and the amenities were even better than we had imagined from the descriptions. The term “cabin” I believe is overly modest. And, talk about 5 star customer service – they are not kidding! The concierge for this house is fantastic. Upon our arrival she gave us the grand tour of the house so we wouldn’t have to spend time hunting to find things we need – and with a kitchen as large as this one, there was a lot to show. If you have a question or notice something not working or missing, do not hesitate to contact her and she will do whatever she can to accommodate. We also appreciated her suggestions on restaurants and activities. Now, I must say, before we arrived we figured that being there a whole week we would want to do a few day trips out beyond South Lake Tahoe, but once we were there to drink in the awesome lake views from our own living room and take advantage of the beauty that was right there, we scaled back on our “away” plans. Our family of four (with two grown children) was more than comfortable with the accommodations. The house is decorated with style and taste, but not so much that you’re afraid to touch anything – a wonderful balance of style and comfort, warm earth tones throughout, beautiful stonework on the bathroom walls, and tasteful and interesting art work in all the rooms. Forgot to bring a book, or a board game? No worries - you'll find a good selection of each here in the house. The location was absolutely ideal. A short walk away is Regan Beach, with a playground for kids and a little further along a stretch of beach where you can watch dogs enjoying a swim in the lake and a game of fetch. Stop by the beach snack bar for a taste of the local ice cream – also available at Eldorado Beach, just another 5 minutes walk. There you can rent a SUP (stand up paddle board) or a kayak. 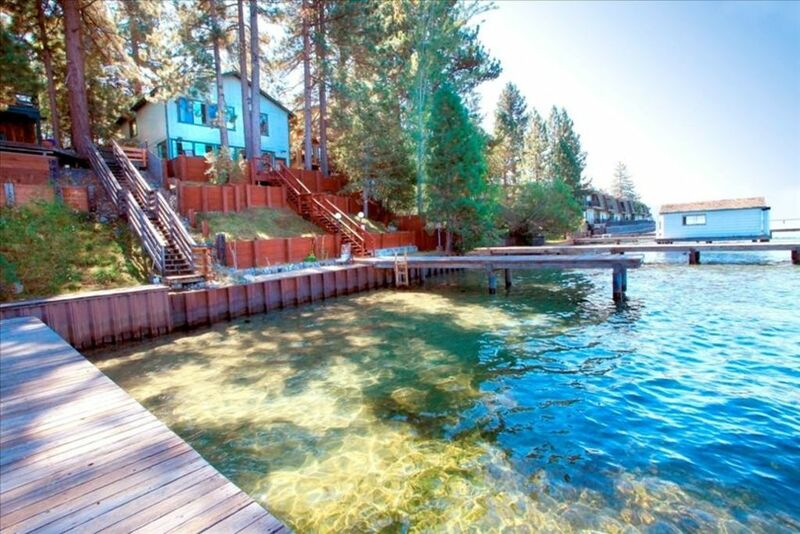 Across from Eldorado Beach, walk just a few minutes west (to the right) on Lake Tahoe Blvd. and you’ll find a bagel shop, a bike rental shop, and Sprouts, which offers delicious, inexpensive, and healthy lunch fare. You might want to take that lunch “to go” though, so you can bring it back to the house and enjoy from the wonderful deck. This house is a gem. I would love to come stay here again.